Looks like fun! I must say Bella looks like the pope! Hold on tight liam! Hmmm… Yes. I like it. Very good stuff Tennyson. I’m relieved to know that my favorite New Year’s phrase comes from a good source. This year, as we let old 2011 go, we went with the simple celebration. Appetizer food, board games and a fire in the fireplace. 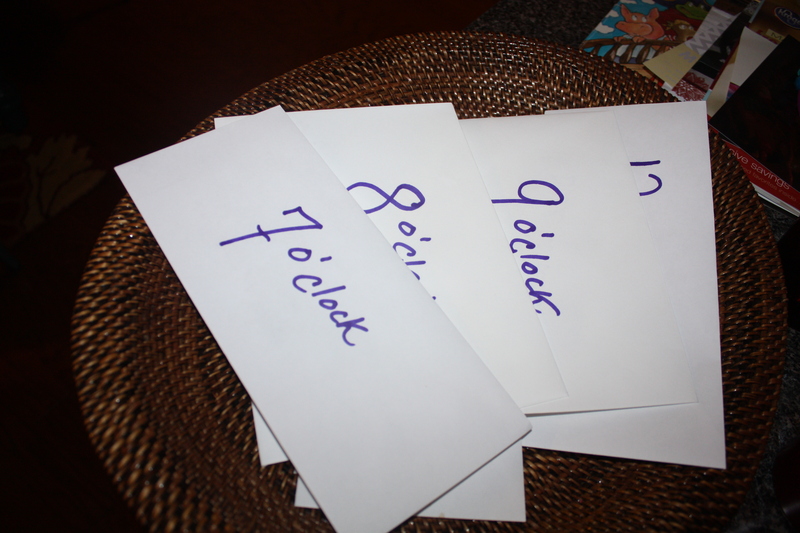 This year I added a fun little touch by making up an envelope to open each hour. Inside the envelopes were little strips of paper with instructions for fun activities such as making party hats or taking awkward family photos.My sister and brother-in-law were good sports. I think this Twilight attempt wins the awkward contest hands down. Although Erin does look quite pretty. Last but not least, we sisters end with awkward middle school poses. So yeah. After we put the kiddos to bed we made cookies and played Catan until 2012 came rolling in. And I had so much fun. Oh and by the way. Our baby comes home this year!